When the Tomcat was retired last year it was with much fan-fare and sadness from Naval fighter enthusiasts. It reminded me a bit of when the Phantom finally left, though a bit more so. I leaves me to wonder if the Hornet will be similarly treated when it is retired in the next 20 years or so. I'd like to be around to see it but probably won't. 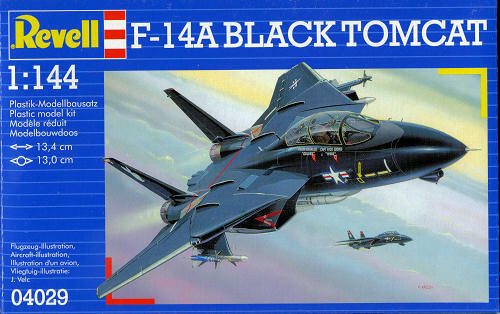 Anyway, when the Tomcat came into fleet service, it was hailed as the perfect fleet defense fighter. The Phoenix missile system around which the Tomcat was designed, was able to engage six different targets, all at the same time and at a huge range. Just what was needed to keep Soviet bombers from reaching the fleet. While never fired in anger, the system did what it was supposed to and that was the important part. From the start the Tomcat was saddled with a less than optimal engine. It was only with the later F-14B and F-14D that an engine was available to meet the design parameters of the airframe. Unfortunately, in the eyes of many, the money was not there to continue production of the F-14D beyond a few dozen airframes. As in all things to do with military hardware, other programs sucked out the funds needed. While the Tomcat did not have the staying power of the Phantom, and thanks to political knee-jerking we will never see one in the air again, it did provide what was needed when it was needed. Those of us who have seen one in the air have seen something we will never forget. This kit from Revell AG is dated 2004 so this is probably the original boxing of the kit. And it makes sense as black aircraft kits seem to sell rather well. It comes on three major and two minor sprues, all except the canopy being molded in black plastic with nicely done, though obviously over-scale engraved detailing. There is a full interior with control sticks, instrument panels (over which decals are placed), and a pair of nice, but somewhat generic bang seats. Now as you might imagine, this boxing is molded in black plastic. As darn little can be seen, I've substituted the sprue shows of a later boxing in grey. The sprues are identical aside from the color of the plastic. 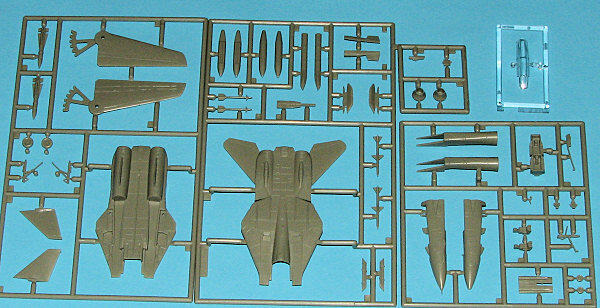 It appears that Tomcat kits can only be designed in one way and that is a horizontally split main fuselage and vertically split nose section. The main intakes are separate and have no compressor facing to install, but in this scale, perhaps it is not needed. The wings are designed to move so that has been taken into consideration. Fins are separate with the stabs molded into a fuselage half. Landing gear are nicely molded and one has the option of building it gear up, though no stand is provided. A nice pair of d rop tanks are part of the package as are the forward Phoenix pallets. A pair of Phoenix, Sparrow, and Sidewinder missiles are provided along with the wing pylons for the latter. Exhaust are molded in the constricted position, which is more for an 'in flight cruise mode' display than on the ground. Actually, it was not uncommon to have one exhaust full open and one full closed when on the ground as frequently one engine was shut down before the other. Instructions are the usual Revell AG fare with only Revell paint callouts. 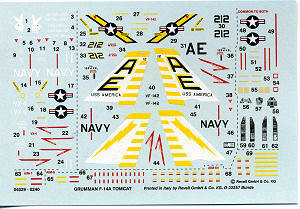 Most of us who have built aircraft kits of this era will be well aware of the FS colors needed, so that is no problem. Markings are provided for two aircraft. One is the black VX-4 bird 'Vandy 1' from 1991 when based at NAS Pt Mugu. The other is a very nice initial Tomcat scheme of light gull grey over white with the white and tan radome. It is for a VF-142 "Ghost Riders' plane from 1976 when they did their first cruise on the USS America. The decals are well printed and provide a full suite of data markings for the plane and missiles. Overall, a fine looking kit in the box. It is well done and probably will turn out as good as if not better than the Dragon kit, which itself is a nice kit. It is also at a relatively good price and would be perfect for those who need to conserve shelf space.